Physix seems to find the formula to be strong but continuous unlike many of the typically top end snow tire balls. There’s another ball we recall with this motion but more about that later. It is extremely difficult for a top line ball to catch anything higher than a B for Value but enough of us liked it that much and were pleasantly surprised by some versatility we weren’t exactly expecting. The Halo uses the new Atomic Core (Asymmetrical) core inside the NRG­™ Hybrid coverstock. What do we have here with the Storm Physix? As you would expect, Storm has created a new top line ball and it’s strong. Not the strongest thing ever but that’s a good thing. That’s where it wins points compared to say a Sure Lock. 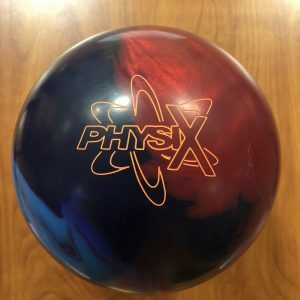 The Atomic is a new asymmetric core for Storm. However, the NRG cover technology is not new. It all started with the Virtual Gravity Nano as they say. This is a hybrid version and I do love Storm’s hybrid coverstocks. They always feel more than the sum of their parts. Anyway, I will not say length with good backend and continuation. Length with energy retention with this ball only comes from a style that either has a good flat spot at the bottom of the swing or speed. That will play out with our testers as you will see. For me, the truth is the ball looked great. When throw decently, the ball does project through the fronts and feels really aggressive down lane. I start to liken the motion to vehicles and this feels more like a high powered GT touring sports car. It’s not the nimblest thing but more than enough. So if you can get it through the fronts, you will be rewarded with awesome downlane motion. The couple of times I pinched it off, I just couldn’t get it downlane, especially on the house shot. It will just go high or crossover. It has a very reliable or trustworthy downlane motion. This gives you confidence to just throw it. But if you’re prone to lifting or hitting up on the ball, you could wind up trying to force it downlane which will hurt you. Sean was next and while he almost exclusively shies away from so much ball and surface on house shots, he had zero problems getting the Physix to work. He didn’t have to work very hard to get it through because he does generate nice projection. The ball just transitioned in a way that gave midlane control but rarely failed to charge back hard to the pocket. He can blow it through rarely where it just dies out that that would be a bad shot off his hand. But the movement was predictable and didn’t die or wasn’t too hard to get to the spot. Doug was next and like Sean and I, he pretty much threw all strikes with the Physix. He didn’t have to get deep on this fresh shot with this ball but also he never felt like it quit. That’s the thing all 3 of us saw, no quit. You would expect it’s possible but a miss tended to be the ball hooking too much, i.e., too early. But this ball looked really good for Doug. It reminded him of the Defiant Soul. That was another fantastic hybrid top line ball that was more than the sum of its parts. That ball was strong but predictable and always could be trusted to hook. When you trust a ball to hook, you relax and adjust to it. When you have to make a ball hook, that’s when you could get into trouble, unless you are a maximum-everything type style. Finally we have Bryan. Here’s where the raving about the Physix came to a screeching halt. I initially had high hopes that Bryan would see something similar to his Lock with the Physix. That is an absolute dream reaction for him. His style allowed the ball to get down lane enough but still drive with a heavy turn. The Physix, not so much. For the first time for any tester, the ball kind of looked like a lumbering strong piece that just dies out before it gets to the pins. It’s like we were looking at a completely different ball. Was a complete struggle. We can argue it’s not enough oil for the ball. Maybe he couldn’t keep it in enough oil to store any energy. He would get in and it never made it up the hill. Unsure why it was so vastly different unless it truly is significantly stronger than the Lock as he was able to easily throw the Lock with no issues. We tested on the 39ft PBA Don Carter pattern. You can actually attack this from multiple angles and just as interestingly, the Physix was flexible enough to also do the same. I could play it up the outside and blend the touchier part of the pattern really well. I could move in and take advantage of the ball’s strong down lane motion. Sean also found it pretty easy to find the pocket with forgiveness coming from the balls strong midlane torque. That’s the hallmark of the ball. Doug saw the same motion with that punchy and predictable strength. We did notice that the ball as expected will break down the pattern and this ball could easily become too much for this pattern within one game. Finally Bryan and the struggle didn’t change much. Still had too much motion from direct but open the angles just slightly and the ball just didn’t store the energy for him. Occasionally, there are certain cover/core shape combinations that don’t match up to a certain bowler. Clearly, Bryan couldn’t match up with the Physix on our test patterns. Perhaps a higher volume pattern would allow the ball to store more energy naturally and have a better look. There you have it with the Physix. It got really strong marks from 3 out of 4 bowlers. 4th bowler struggled significantly to get any look at all. 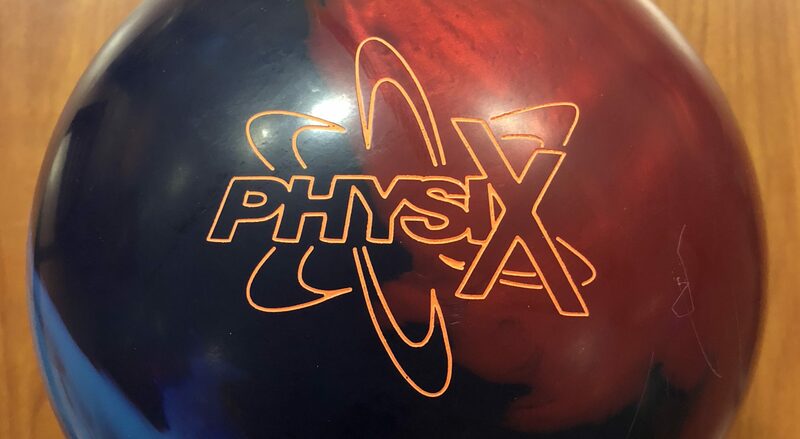 Ultimately, it’s clear that while the Physix is strong, if you are capable of projecting this ball through the fronts, it has that strong reliable move that doesn’t feel lazy like many snow tires can feel. If you liked the Defiant Soul, you may take a liking to the Physix as well. It is strong. It will burn up the fronts like a strong piece. But it clearly has its place at the top of the heap and in a way we could see easily fill the top spot in the bag, especially for bowlers with higher tracks.